Operation Northern Shield is an example of Israel's defense strategy against Iran's asymmetric warfare. Recently, I had a discussion with a renowned Israeli Middle East expert who thinks the Netanyahu government is exaggerating the threat posed to Israel by Iran. He pointed to the fact that Iran’s military is inferior compared to the Israel Defense Forces, giving as an example Iran’s fleet of warplanes, no match for the Israeli Air Force (IAF). I then reminded him of recent remarks made by Qassem Soleimani, the shrewd commander of the elite Quds Force of the Iranian Revolutionary Guards Corps (IRGC) which is tasked with exporting the Islamic Revolution, and said he was wrong about Iran’s capabilities and the threat it poses to Israel. Responding to threats made by US President Donald Trump Soleimani warned the United States that in any future war Iran would destroy all the US possesions and made clear how the Islamic Republic would achieve this. “You know our power in the region and our capabilities in asymmetric war. We will act and we will work," the Quds Force commander said at the time. Soleimani’s rare statement about Iran’s asymmetric warfare capabilities came inti mind again when the IDF revealed it had started Operation Northern Shield. The operation in northern Israel aims to destroy the cross-border attack tunnels built by the IRGC-founded and supported Lebanese terror organization, Hezbollah. The construction of these terror tunnels is part of the ongoing Iranian effort to undermine Israel and the United States via asymmetric warfare. “It is also part of a regional and global terror effort led by Iran,” according to the Israeli leader, who explained Operation Northern Shield is part of a comprehensive effort to curb Iran’s belligerent activities in Lebanon, Syria and Iraq where the IRGC recently supplied ballistic missiles to Shiite militias of the umbrella organization Hashd al-Shaabi. The tunnels under the Israeli border were discovered in 2014 by using new seismic sensors and audio systems which enabled the IDF “to listen to the ground and identify suspicious activities,” according to a senior IDF officer overseeing the new operation against Hezbollah. 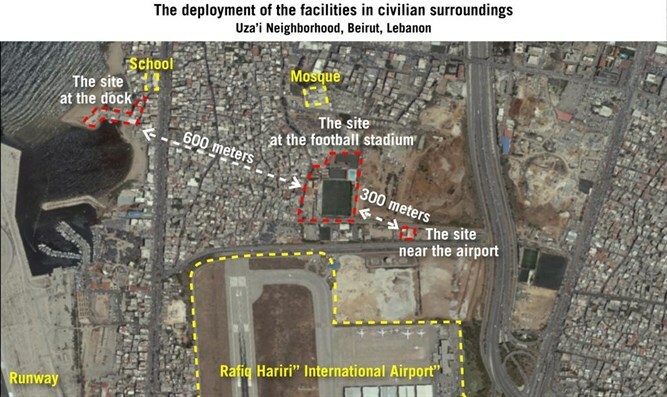 The Lebanese terror group not only received funding for the project from Iran, but also got assistance from North Korea which built similar attack tunnels along the border with South Korea in the past. According to North Korea expert Dr. Bruce E. Bechtol, the Korean Mining Development Company sent engineers to southern Lebanon years ago who, disguised as Chinese foreign workers, supervised Hezbollah’s tunnel project. Hezbollah and the Quds Force were reportedly caught off guard by the Israeli operation and have yet to respond to the new humiliation they suffered at the hands of the IDF, which was amplified by a video which the Israeli army released on Tuesday. Footage made by an IDF robot inside a tunnel close to the most northern Israeli city Metulla, showed how two Hezbollah terrorists approached the camera of the robot after which a small explosive device was detonated causing the men to flee. The publication of the video teaches us something important about Israel’s new defense doctrine. It showed how the Israeli military is using cutting edge technology in what I would like to call ‘sophisticated and intelligent warfare’ to confront and humiliate its enemies. This ‘sophisticated and intelligent warfare’ was first on full display at the end of January when the Israeli Intelligence Agency, the Mossad, carried out a daring operation in Tehran and stole Iran’s nuclear archive. After the revelation of the Mossad operation by PM Netanyahu on April 30, pundits were quick to suggest he tried to influence President Trump who had not yet announced he would quit the nuclear deal with Iran. In reality, however, Israel was delivering a message to the Iranian axis: We know exactly what you are doing and what you plan to do wherever it is! The second time the Israeli military showed that it was using a new defense doctrine was on the night of May 10, 2018. After the IAF carried out a series of attacks on Iranian weapon convoys bound for Hezbollah and the Quds Force in Syria, Qassem Soleimani ordered missile attacks on northern Israel. Twenty Grad and Fajr missiles were launched in the direction of northern Israel from Syrian soil, but none of them reached their targets. Using 28 IAF F-15 and F-16 fighter jets, the IAF then destroyed more than 50 Iran-related targets in Syria, among them intelligence facilities, logistic headquarters, observation posts, weapon-storage facilities, rocket launchers and air defense batteries. IDF Spokesperson Brig. Gen. Ronen Manlis explained at the time that the Israeli army plundered the Iranian capabilities in Syria in April and May. In Gaza too, the IDF is using sophisticated and intelligent warfare to outflank Hamas and the other Palestinian terror groups. A Special Forces unit of the IDF recently set up a base in the heart of the Hamas-controlled coastal enclave which was used to gather intelligence. The Israeli soldiers entered the Gaza Strip using fake IDs and disguised themselves as aid workers who distributed medical items to the Palestinian population. The operation was aborted when the unit’s vehicle was stopped at a Hamas’ checkpoint after which the IDF soldiers were interrogated and then engaged in a shoot-out with Hamas terrorists, killing seven of them, but a Druze IDF colonel lost his life during the attempt to return to Israel. Israel has also used intelligent and sophisticated warfare to curb the threat posed by Hamas missiles and terror tunnels. The Iron Dome anti-missile shield has proven to be highly effective in downing incoming missiles while the Israeli military has developed an underground ‘Iron Dome’ system to neutralize Hamas’ terror tunnels. Then there was a new Israeli operation against Iran in Syria which took place last Thursday. After Iran and Hezbollah rebuilt some of the military facilities destroyed by Israel on the night of May 10th, the Israeli military again delivered a devastating blow to the Iranian axis in Syria. Shortly before midnight on November 29, the IDF used surface-to-surface missiles and LORA long-distance artillery shells to destroy 15 Iranian and Hezbollah military targets in Syria, among them the headquarters of the Quds Force of the Iranian Revolutionary Guards Corps in Al-Kiswah, south of Damascus. These events also show that the IDF and IAF understand the value of psychological warfare in a region where honor is the most important societal value. This could be an indication that the Israeli military has finally found an effective answer to the asymmetric warfare used by Iran and its proxies.